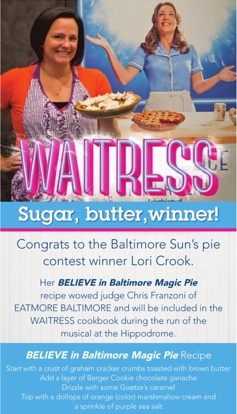 Fresh off our win for “BEST CHILI” at The Baltimore Station’s annual cook-off to support homeless veterans, MMHA’s Lori Crook was just crowned winner of The Baltimore Sun and Hippodrome’s pie baking contest for “Waitress: The Musical.” Lori’s “BELIEVE in Baltimore Magic Pie” features legendary local flavors like Berger Cookie ganache and Goetze’s Caramel Creams, and it’s topped off with an Oriole-orange marshmallow whip and sprinkle of Raven-purple sea salt & sugar. Get her original recipe in the attached picture – trust us, it’s as easy as pie! Special thanks to MMHA member Zeffert & Gold catering company who served as Lori’s culinary mentor with both the chili and pie recipes. Together, MMHA is proud to support the arts and the community!